Built for short, sharp burst of speed in every direction, be quicker and more dangerous when you lace up in a pair of Netburner Super FF Netball Trainers from Asics in Indigo Blue and White. 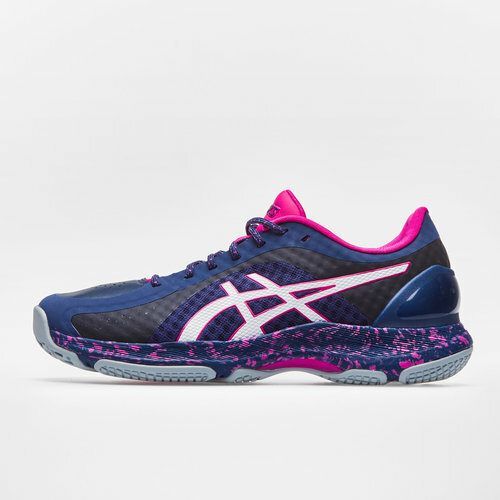 These Asics netball trainers have been built for explosive movements around the court, helping you to make short, sharp darting runs in every direction, so if you're the key player make sure this is your shoe of choice. Utilising technology including the Asics Gel which cushions the foot when jumping and landing ensuring you're at your best all game long. With AHAR+ offering extra durability and grip on every surface. These trainers have a twin-layer structure that is made of lightweight Solyte™ and high bounce SpEVA™. The cushioning properties of Solyte™ absorb impact when striking the ground, while the rebound qualities of SpEVA™ enhance movement into the next step creating a FluidRide.